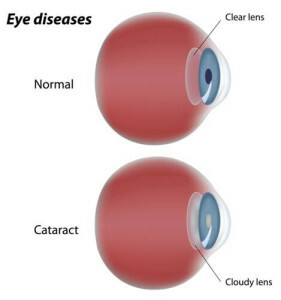 A cataract is a cloudiness of the natural lens of the eye that dims or blurs vision. Sometimes it causes glare or halos around lights at night, and may reduce perception of colors and change the focus of the eye. If your sight becomes too poor to carry out your normal activities, the cloudy lens must be removed by surgery if there is to be any improvement in vision. With the latest advances in Intraocular lens (IOL) implants, vision can be restored. The important thing is to find the IOL that is best for your specific needs. Crystalens, Toric, ReStor and TruLign premium refractive lenses, or the Staar and Tecnis standard monofocal lenses are a few implant choices. Dr. Garrett pioneered the use of small incision phakoemulsification cataract surgery, being the very first surgeon to perform this modern technique in all of Wisconsin and the Upper Peninsula. Dr. Garrett has over 30 years of experience has done over 30,000 cataract surgeries. Recognizing that the quality of your vision affects the quality of your life is why Dr. Garrett opened the first and only Freestanding Ambulatory Surgery Center in the Upper Peninsula dedicated to ophthalmology. He has consistently adopted the newest proven methods and cataract surgery techniques that provide added safety for his patients. One of the more recent technologies that Dr. Garrett makes use of is the Crystalens. He was the first local ophthalmologist to utilize the Crystalens beginning in the summer of 2007. In recognition of Dr. Garrett’s leading use of crystalline lenses, Bausch and Lomb recently presented him with the National Center of Excellence Award. In cataract surgery, the cloudy lens is removed and replaced with a clear lens, called an intraocular lens (IOL), or implant. The primary goal of all cataract surgery is to allow the eye to regain its maximum potential for vision and reduce dependency on glasses. We offer many choices in lens implants. Dr. Garrett will work with you to determine which IOL is best for you. Basic Cataract Surgery uses the monofocal IOL which has been used for 50 years and is the basic lens covered by Medicare and private insurances. With a monofocal lens, a patient can have both eyes set for distance vision, or one eye set for distance and the other set for near vision. Either way, most patients with standard cataract surgery will need reading glasses or bifocal/trifocal glasses after surgery. Refractive Cataract Surgery uses advanced IOL’s and techniques to provide the best uncorrected vision available after cataract surgery. There are three main types of IOL procedures we offer for our Refractive Cataract Surgery patients: Crystalens, ReStor and Toric and TruLign IOL’s, as well as laser-assisted cataract surgery. The ORA system is a small device that attaches onto the microscope used during cataract surgery. It works by assessing your eye during surgery, much like a GPS tracks your progress on the road. The ORA takes approximately 120 live readings of the eye, and with this data, our doctors can arrive at a better result. This customized procedure allows the doctor to choose the most accurate IOL power (strength) for your individual eye after the cataract has been removed. This is the best time to make this determination to offer the best result possible, regardless of which implant you have chosen. The ORA is highly recommended for patients that have had LASIK surgery in the past or are combining astigmatism correction with their cataract surgery. Head over to our News & Media page for more videos on Dr. Garrett and the services we provide at Garrett Eye.